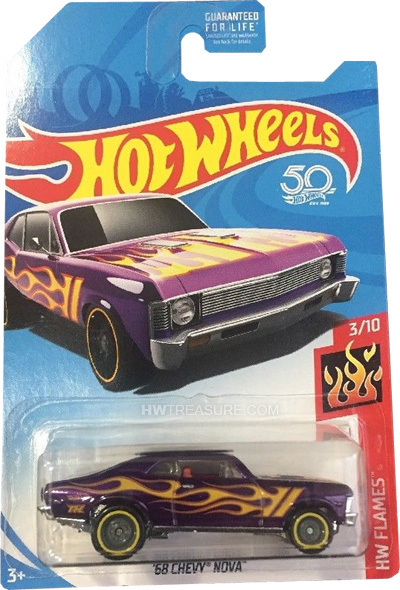 FKB41 is 3/10 in the HW Flames series and part of the 2018 Super Treasure Hunt set. It is Spectraflame purple decorated with yellow stripes and flames outlined in orange. “TH” and the Hot Wheels logo and appear on the back side panels. It has clear windows, a red interior, gray Real Rider Wheels with yellow rims, and a chrome plastic Malaysia base. The ’68 Chevy Nova is based upon the actual vehicle and made its debut in the 2004 First Editions. A second version, without the hood scoop, first appeared in 2009 as the Mississippi vehicle in the Connect Cars series.